Who is this fundraiser for? This fundraiser is for my Mom, Ms. Jyothi who is 54 years old and a single parent. Why we seek your help? 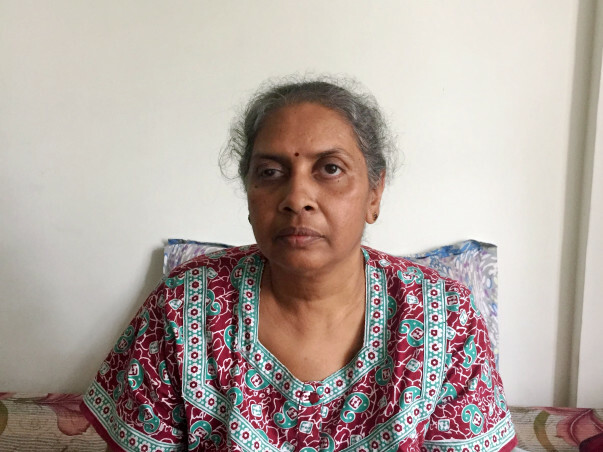 My Mom Ms. Jyothi got diagnosed with advanced Breast cancer in August this year. She was diagnosed with Breast Cancer in the year 2015 following which she underwent complete course of treatment at Sri Shankara Cancer Hospital and Research Centre, Basavanagudi, Bangalore. 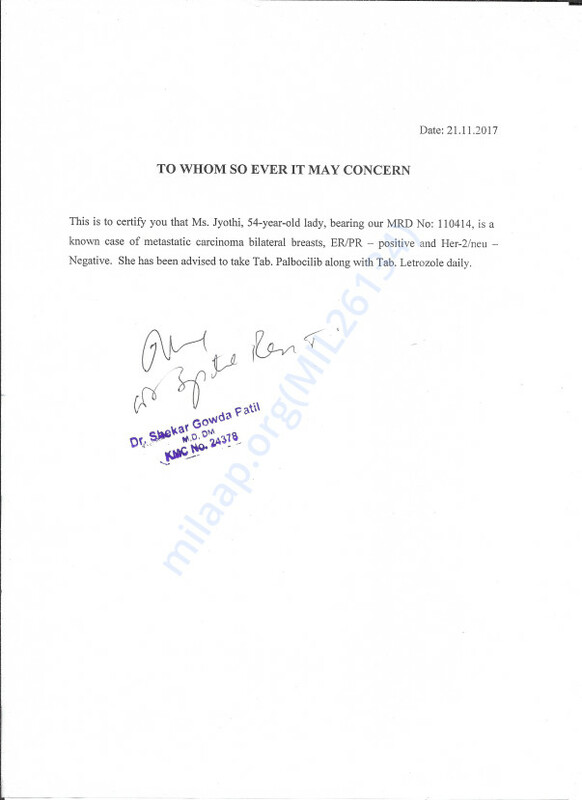 However, the cancer returned this year in August 2017 in the bones for which she has been advised further treatment that we cannot afford on our own. 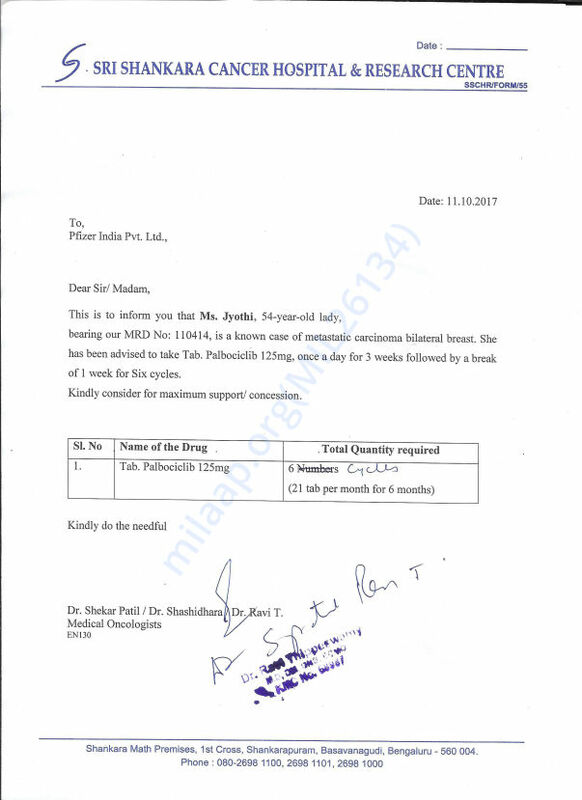 So far, we were able to manage the treatment through the medical insurance policy provided by my Brother's company, but medical insurance policies are not valid for advanced treatment that helps prevent further growth of the cancer cells in the body thereby increasing quality of life and life expectancy. When do we need the funds? 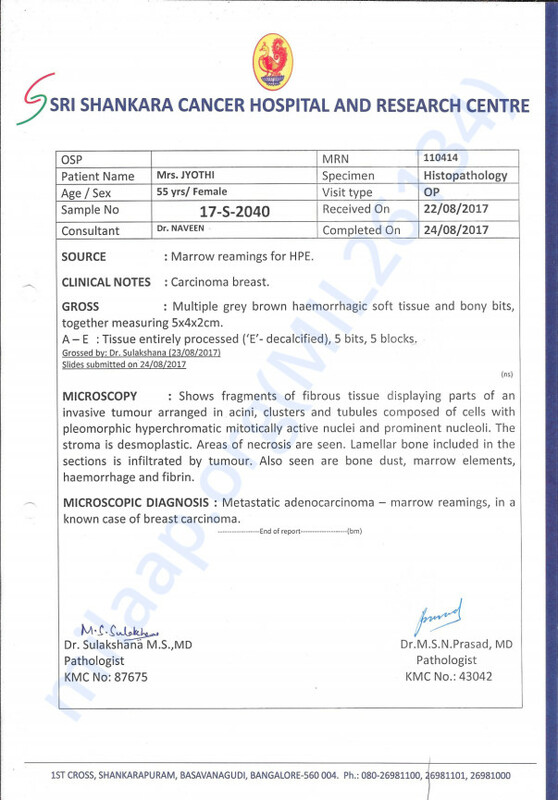 We need the funds as soon as possible as recurring cancer is generally aggressive and we need to start giving her the medicines before the cancer cells spread to other parts of the body. How do we plan to use the funds? Your support and contribution can help save my Mom's life. As we keep hitting the target of Rs. 76,000/- for each bottle of medicine, we will keep uploading the invoices here. Although we have not been able to raise the required amount of funds and reach the target, we are withdrawing the funds to utilize the same for further chemotherapy and treatment advised by the oncologists as we are very much in need of funds for Mom's further treatment. We shall be uploading the oncologist's prescription for further treatment by next week. At the moment, we have uploaded one of the prescriptions readily available for us, and we shall be uploading another prescription for further treatment by next week as mentioned above. Wish you a very speedy recovery. Stat strong and positive. Moms are precious. Hope yours gets well soon. Hugs.